"Members of the University of Rio Grande School of Fine Arts’ Grande Chorale is sending nine of its members to the American Choral Directors Association (ACDA) regional convention in Chicago, Illinois at the end of February." inform Jackson County Times-Journal. The event brings choral directors and students together to network and learn new skills and techniques. Dr. Sarin Williams, assistant professor of music, said she is excited for her students to make the trip. 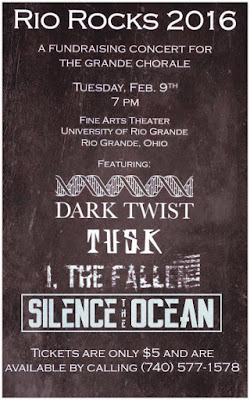 To raise funds to send the students, the Grande Chorale will host Rio Rocks 2016, a concert featuring local bands from Gallia County Tuesday, Feb. 9 at 7 p.m. in the Alphus Christensen Theater of the Fine Arts Building. Williams said the event is completely student organized and is excited to see her students’ hard work and interest in getting to the convention. Williams said Kyle Fannin, a sophomore multi-age music education major from Jackson, Ohio, took the lead in the project. Fannin said music was the inspiration for the fundraiser and he is eager to see the event come together. Jordan Lombardo, a senior music comprehensive major from Jackson, OH, said he is a supporter of local music, and is glad he gets to be involved with the event. 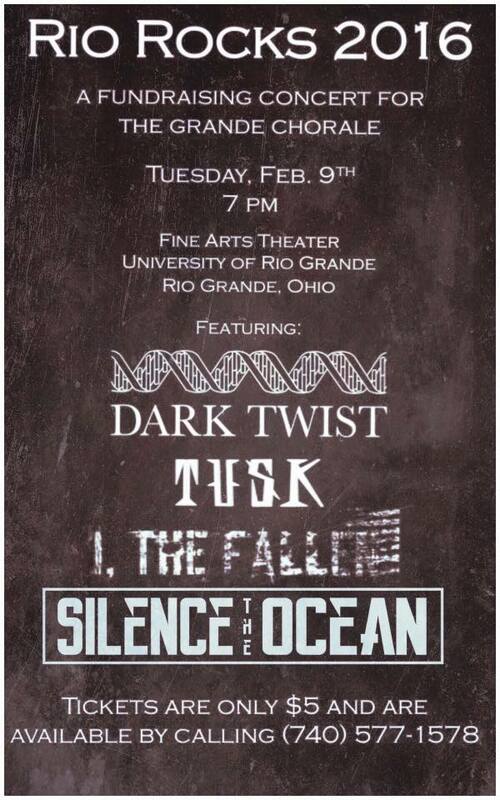 The four local bands performing are Dark Twist; Silence the Ocean; Tusk and I, the Fallen. The bands perform either rock, or sub-genres of rock such as metalcore or rock and roll. Tickets for the event are $5 at the door. The Grande Chorale will also be selling popcorn, water and pop. For more information on Rio Rocks, contact Jessica Patterson at (740)-245-7463.